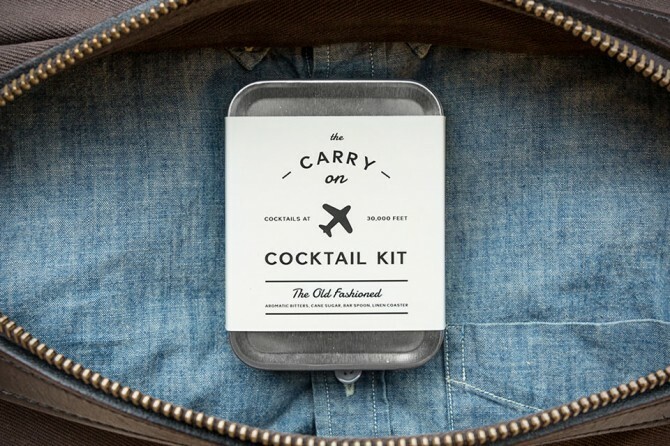 If you’ve ever been stuck on a plane with screaming babies, lengthy delays or the armrest you need to share with the person sitting next to you, you know the need for a stiff drink. This cocktail kit provides everything you need to make two proper old fashioned cocktails. The only thing you need is the hard stuff. The Carry on Cocktail is the result of a collaboration between W&P Design and PUNCH, two cocktail-obsessed companies, based in Brooklyn, New York. 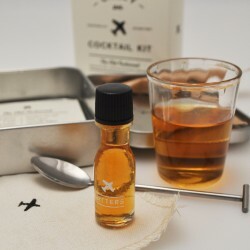 At 30.000 feet you need to carry on your kit, order a mini-bottle of bourbon and use the combination bar spoon/muddler to mix in the included cane sugar and small-batch bitters. Cheers! 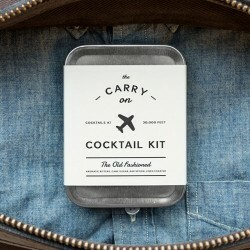 The kit contains a carry on tin, recipe card, spoon/muddler, aromatic bitters, cane sugar and a linen coaster.